Apartment 34d, 34 Montpellier Spa Road is a charming split level apartment that feels like home. It has a great fitted kitchen with breakfast bar overlooking the Gardens of Montpellier. Gorgeous velvet button back sofas complement the period features in the living room. Bathroom with separate shower. 2 bedrooms one with zip and link beds which can be made a super king doubles or 2 singles, one with a king size bed. 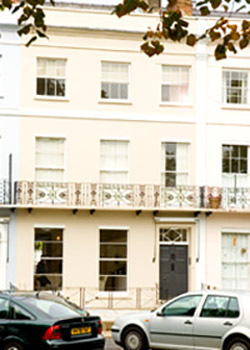 34 Montpellier Spa Rd, GL50 1UL is in our south west facing period building overlooking Montpellier Gardens to the front and Imperial Gardens to the rear. These apartments are all beautifully decorated with furnishings that are contemporary and to the highest standards set by Quintessential Apartments. Our selection of apartments in this building include both one and two bedroom properties, they all benefit from high speed broadband and are fully serviced, making them the perfect home away from home.